If anyone else thinks he has reason for confidence in the flesh, I have more: circumcised on the eighth day, of the people of Israel, of the tribe of Benjamin, a Hebrew of Hebrews; as to the law, a Pharisee; as to zeal, a persecutor of the church; as to righteousness under the law, blameless. But whatever gain I had, I counted as loss for the sake of Christ. Indeed, I count everything as loss because of the surpassing worth of knowing Christ Jesus my Lord. For his sake I have suffered the loss of all things and count them as rubbish, in order that I may gain Christ and be found in him, not having a righteousness of my own that comes from the law, but that which comes through faith in Christ, the righteousness from God that depends on faith – that I may know him and the power of his resurrection, and may share his sufferings, becoming like him in his death, that by any means possible I may attain the resurrection from the dead. Not that I have already obtained this or am already perfect, but I press on to make it my own, because Christ Jesus has made me his own. Brothers, I do not consider that I have made it my own. But one thing I do: forgetting what lies behind and straining forward to what lies ahead, I press on toward the goal for the prize of the upward call of God in Christ Jesus. Today we have for our meditations this fragment from the letter that Paul the apostle wrote to Christians in Philippi. And in these verses which we just heard Paul is responding to a certain problem that was plaguing Philippi congregation. There were people who were teaching what actions those Christians in Philippi needed to take in order for them to get on good terms with God. And this is what we too want to investigate. For what was happening in Philippi is happening, we could say, on a universal scale also today. What do I mean by that? Okay. We know what we as Christians believe. We live, we die, and then we face our Creator and then we give an account of how we have led our lives. But we could say that this is how the vast majority of human beings think about their fate. Not only Christians. We live, we die and then we will be held accountable for how we have lived here. We could say that this is one of the universal consensuses of the humanity. For everyone knows, feels, senses, that there is something more, some kind of a higher being, a higher existence. Then everyone also knows, feels and senses that we are not simply mortals. We are something more. For this is how we experience our life. We know that we are we. I know that I am the same me that I was 20 or 30 years ago. Surely, everything changes. Environment, people around us, ourselves. But this knowledge that I am remains through the time. We sort of travel through the time. Thus, it is not surprising that we can sense that our existence won’t end with our death. Finally, we all also know that we are accountable. We all have this voice inside us, our conscience. It argues with us. It accuses us when we have done wrong. It doesn’t leave us alone when we don’t do what we should. It knows our every thought and desire. It reminds us that we are accountable. What happens next with all these experiences? Then we try to come up with an action plan – what to do so that we are good when the Last Day comes and we need to give our account. And you can see that all people do this. Some are more conscious about it, some less. The same thing happened in Philippi. Those guys who bothered Christians in Philippi believed that you need to observe certain Jewish customs if you want to stand well on the Last Day. They tried to persuade Philippians to do them. This is what Paul was responding to. What did he say? Paul could actually understand very well what they believed. For he himself used to hold those beliefs. That’s why he replies giving his testimony. Paul says that if that was how we get good with God, then he would have succeeded more than almost anyone else. Why? Because he has all the credentials that those Jewish people could imagine. He was circumcised on the eighth day, he was of the people of Israel, of the tribe of Benjamin, not of one of the tribes that had fallen away from Israel. He was a true Hebrew of Hebrews, meaning, from the people who faithfully returned from their exile in Babylon. And when it came to the observance of their laws and rituals, he was a Pharisee, that is from the strictest observers of religious laws. And if anyone wanted to know how passionate he was about upholding all these requirements and resisting anyone who would doubt them, then Paul says that he was actually a persecutor of the church, for he believed Christians have corrupted Jewish sacred practices and beliefs. Summarizing, if anyone could settle his account with God by doing certain things, then as Paul says, he was blameless. He would have done it, if that was possible at all. But then he goes on, “whatever gain I had, I counted as loss for the sake of Christ. Indeed, I count everything as loss because of the surpassing worth of knowing Christ Jesus my Lord. Okay, what is Paul saying? That whatever he used to consider as his merits before God, as something that would prove that he is a good man, who has led a good life, that God should be pleased with him, – now he considers all of that as loss, as rubbish. We need to understand this well. For this apply to everyone. To every human being. If there is something that we consider as our good and moral and praiseworthy actions that would make us look good in God’s eyes, then they become, in fact – greatest obstacles in our relationships with God. Christians and non-Christians may think along the lines of – “I haven’t done anything really bad, I haven’t harmed anyone, not much anyway, I am not a murderer, or a thieve, or a liar, I am a decent person, I have tried to lead honest live, I have cared for others, I have helped people. It doesn’t work this way. Yes, our conscience tells us that God is our Judge, and it is true, but that is not all truth. Yes, He is our Judge, but first and foremost He is our loving Creator, He is our gracious and merciful Father. He is not after a few good things which we may or may not have done in our lives, thanks to the opportunities given by Him. He is not expecting you to show how good and moral you have been. He is after you. He longs for you. He longs for relationships with you. He desires to reveal to you His loving heart, He wants you to know how much He cares for you, how much He has done for you, and how much He has prepared for you in the age to come. To stick in His face that we are not that bad and have lived decent lives is to misunderstand who true God is and how He wants to relate to us. Think about this analogy with marriage. See how foolish and inadequate that is. But this is what our attempts to show that we have been good and moral people look like, when our God comes to us, reveals Himself, offers to be your God, to walk with you, to bless you beyond your wildest imagination. This is what Paul is trying to explain. That he considers all his attempts to merit good standing before God totally futile. Waste of time. Rubbish. Why? Because of the surpassing worth of knowing in Christ Jesus what true God is like. Because He finally met Jesus. Actually, Jesus met Paul. Jesus, God who revealed Himself becoming one of us, He appeared to Paul. He spoke to Paul, He showed him a glimpse of what He is like and what life with Him is like. He turned Paul’s life upside down. And because Paul had experienced the presence of resurrected Jesus, because He had learned that it is true, that Jesus was raised from the dead and the He has done everything so that we can approach our Creator without fear and with good conscience, Paul understood that God’s grace and mercy are not something we need to merit. It is something that God offers to us as His gift, as undeserved gift, to all who are willing to accept it, who want to respond to His revelation in Jesus and to trust that our God is gracious and merciful, generous with His forgiveness and love, and abundant with His blessings to those who trust His promises. Therefore, Paul could say that the only thing he desires is to be found in Christ. Meaning, be united with Christ. Being pronounced good in God’s eyes, not because of what he had done, but because of what Jesus has done for us. “Because you are united with Jesus, you too are my beloved child, and with you I am well pleased!” These words change our lives as they did Paul’s. They make us free. They give us true freedom. They take away the never ceasing need to justify ourselves. For we know that we already are accepted, loved, cherished and cared for by the Almighty God, who also happens to be our loving Father in heaven. We can experience it already now, as our God speaks to us, as He comes to be with us, as He smiles at us and hugs us through our brothers and sisters in Christ. And when the Last Day comes, when God fulfils all His promises, when He restores the heavens and the earth in their goodness, when He destroys death and sin and devil, we will dwell with Him rejoicing in our resurrected bodies. This was Paul’s hope. This is our hope. This is where we are heading. But… and we need to ask this. Is that it? So, we don’t need to do anything? God has done everything? We can now just go our ways and not care about anything? When it comes to us being reconciled with God, adopted in His family, made fellow-heirs with Jesus, all this is already done. That was God’s work anyway. It is done and it is given to us as gift. As the most precious gift of eternal life. There is nothing to be done or added. That is yours. But does it mean that we can just lay back and do nothing. Paul says – no! He compares our lives with a race. By God’s grace we are made participants of this race, and our Father has already prepared the prize for us. He Himself empowers us with His Spirit to run this race, and this is what Paul says, – don’t look back, press forward, keep your eyes on your prize and finish the race strong. Our lives are this race. We can’t stop now. 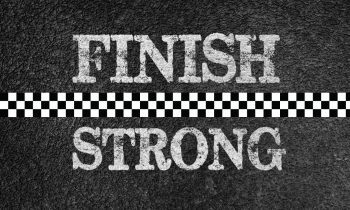 We need to get to the finish line. We can’t stop pressing forward. We can’t become lazy and complacent Christians, who think that God owes us something. We have been chosen, we have been called, we have received God’s Spirit, we have been enabled to run the race, and, in fact, there is nothing more joyful in this world anyway, as to follow our Lord Jesus. And so, we press on! We use all the help that our gracious Lord gives us. We listen to His Word, we read it, study it, discuss it, we strengthen one another in this company of God’s people, we support and encourage one another in this race, we pray for one another, we get strengthened by Christ own Holy Sacrament, and we do it together with one another and with the Holy Spirit. That’s for today, some wisdom from Paul. Remember, you don’t need to justify yourself before God. It is already done. You are forgiven. You are pronounced to be very good. Now, let focus on the race, let’s use all the help that is given, and let us finish strong, and then we will celebrate together.